When I was a small child (read: under ten years old), one of my favorite things was big family gatherings. Birthday parties were a special favorite of both my brother and I, and we'd often turn the memories into bedtime stories by making our cousins "princes" and "princesses" of whatever city they lived in. But, once a year there was the Farley Reunion, held at my grandparents' house. I think what was most exciting about it was the re-arranging of the yard. Picnic tables would appear from the woods, the slide would move from the concrete patio to the hilly grass, and there were other small changes (like new pails for the sandbox!). Fast-forward seventeen years: since I'm living in the northeast once again, I was able to attend this year's Farley Reunion (first time since 1992 for me). The location has changed, and those in attendance have shifted somewhat, but it's still a good time. Jonathan and I set out from our place, and were pleasantly surprised to find that our destination was about twenty minutes closer than planned, so we detoured a bit and followed some signs for "NJ sweet corn" and "cheese." We came upon a small stand stocked with vegetables and a small refrigerator with dozens of eggs and some cheese. We looked over the various kinds and chose two blocks, paid (aka added up our total and put some money in a jar), and headed toward the Reunion. We were the first to arrive and sign the register, which I flipped through later on to see all of my mom's previous sign-ins. As we helped move around some food, others started to arrive, and by 1:30 or so we were all eating. We sat with my grandparents and my Uncle Carl (among others), so it was good to catch up, talk about our new place in Pennsylvania, etc. Chatting was followed by the annual meeting (and the first time I paid attention instead of gallivanting off to the slide or a big wheel) and photograph. 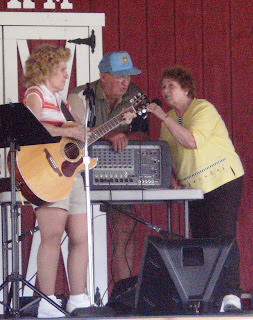 What was particularly unique this year was the performance of several Country songs by Ann Brown. My grandparents had a great time dancing, and there were eight or so of us on the dancefloor at one point (which is pretty good, considering there were about twenty people in attendance this year). 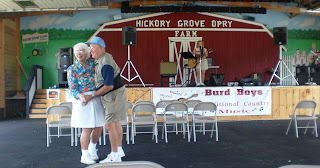 My grandfather even got up on stage to join Ann for a few numbers. Things began to wind down, and since it was early yet, we opted to head over to Rocky Top for a bit. ...On the way to the Reunion, I was a bit frustrated with not recognizing anything. I assumed that I would, at least a little bit! But, as we trucked along into Califon, it all came together for me. Once the A&P was in sight, I rattled off the other surrounding stores/businesses (well, what they used to be) to Jonathan. We made a quick stop on the way to add another cousin to the happening and ended up getting a short opportunity to visit more family that I haven't seen in a very, very long time (and a cousin I had not yet met). I was quite excited by this surprise, as I have reconnected with this bunch a little on Facebook over the past year or so. Then it was on to Rocky Top, which had been my grandparents' house when I was little, but now houses my Uncle Carl and his family. It's changed some, and now has a really nice deck and pool. We sat out there and talked for a couple hours, and Jonathan and I headed out shortly after my cousin Erica got home from work, since we still had to go to the grocery store before it got too late. We took a different route back, confirming that it's only just over an hour's drive. The proximity is still a little surreal for me, since I've been so far away for so long. Now it's only a matter of time before we venture a bit farther to see my paternal grandparents and other family on my dad's side.